This is an artist's view of one of the student-invented adhesive applicators applying adhesive to a rock surface on the ocean floor. 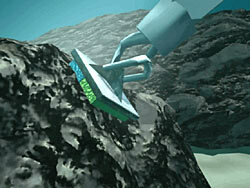 Click on the still frame above to see an animated movie of the "Sponge" applicator in action. File size = 2 MB. Click on the still frame to see an animated movie of the "Baggie" applicator. 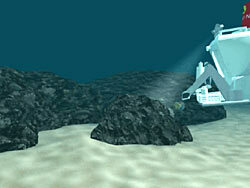 The submersible Alvin is shown on the right side of the image with the grappling arm holding the adhesive applicator. File size = 2MB. Dr. Tivey at the Woods Hole Oceanographic Institution.